NBA legend Kareem Abdul-Jabbar oversees a supernatural dunk contest in the clip directed by Isaac Rentz. Linkin Park launch their 2017 tour this weekend at the Maximus Festival Argentina in Buenos Aires as part of a series of South American shows this month before they head to Europe for appearances in June. 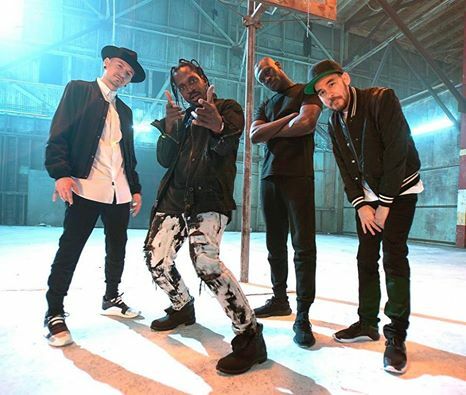 The group have just announced dates for a North American tour with guest Machine Gun Kelly, with shows set to begin in Boston, MA on July 27. In an effort to reduce scalping and access via bots, a Linkin Park presale powered by Ticketmaster Verified Fan will utilize unique fan-first technology to level the playing field and ensure fans compete against other fans for tickets, not software. The more you participate, the higher your spot in line and the better your access to tickets. Linkin Park fan club (LPU) members will get priority, but anyone can work their way to the top. The pre-sale is on now, with general public tickets available on May 12. Every single full-priced ticket purchased for the tour includes a choice of a standard CD or standard digital copy of the "One More Light" album. $1.00 from every full priced ticket sold on the tour will benefit Music For Relief, the charity foundation Linkin Park founded in 2005 to aid survivors of natural disasters and environmental protection.